Irene and her brothers Fred and Harry sailing Zephyr. Despite her highly impractical attire, Irene survived two capsizes in one season. Image William James Hall, ANMM Collection 00002619 Gift from Bruce Stannard. The next month Irene became the first woman to sail a winner in a Sydney regatta – the Anniversary (now Australia Day) Regatta. She only sailed for one season, but in that time her fame spread as far as Britain. Irene took to the water at the height of the open-boat era, when hugely over-canvassed boats competed for lucrative prizes, and sailing was as popular with the punters as horse racing. Observers crowded the foreshores and followed the races in ferries. Betting on the boats, though not legal, was widespread, and punters avidly followed their favourite skippers. The open boats pushed the limits. The length was mandated but the beam, depth and sail size were not. In the 1890s there were boats of just about every length, from the 24-footers (7.3 metres), which could carry a crew of up to 20 men, down to the mosquitoes of the fleet, the 6-footers (1.8 metres). 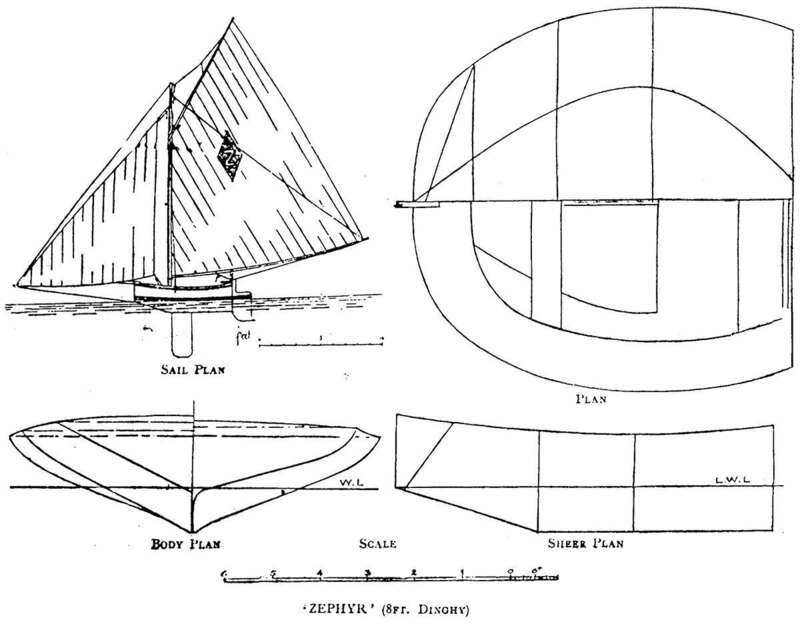 Diagram of Zephyr from Australian Wooden Boats, Volume One, reprinted from The Yachtsman, 13 April 1899. Photographs show her dressed in the voluminous blouses and, presumably, the skirts and dresses of the era. How she did not drown when they capsized – and she capsized twice in her six months – is a mystery. Irene was the only girl in a family of eight children. Her father, at least three brothers, and her eventual husband were all boatbuilders. Irene Pritchard and one of her brothers in Zephyr, 1899. Photo courtesy Nedlands Library, WA. 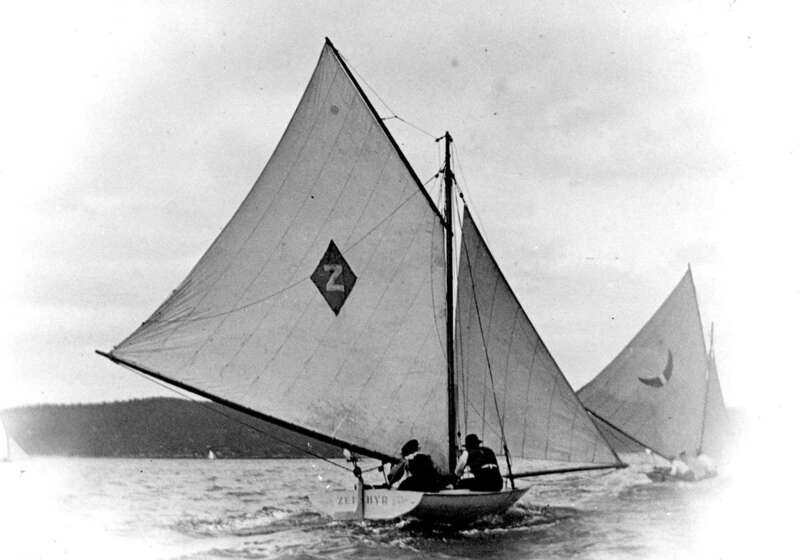 The Pritchards registered Zephyr with the Johnstone’s Bay Sailing Club (JBSC). This bay lies between Balmain and Pyrmont and today is spanned by the Anzac Bridge. Irene was elected as the first female member of the club in December 1898. The JSBC was both her local club – Balmain Sailing Club had folded, though it would later form again – and arguably the most innovative club in Sydney at the time, and the most likely to accept a woman as a member. Perhaps Irene survived in this environment because she was raised with seven brothers, and only sailed with them – and Harry, six years older, might have protected her from the worst – and also because, at the age of 23 she had the maturity to cope with it. The course of the eight-footer races, covering some 11.5 kilometres. Drawing by David Payne/ANMM. 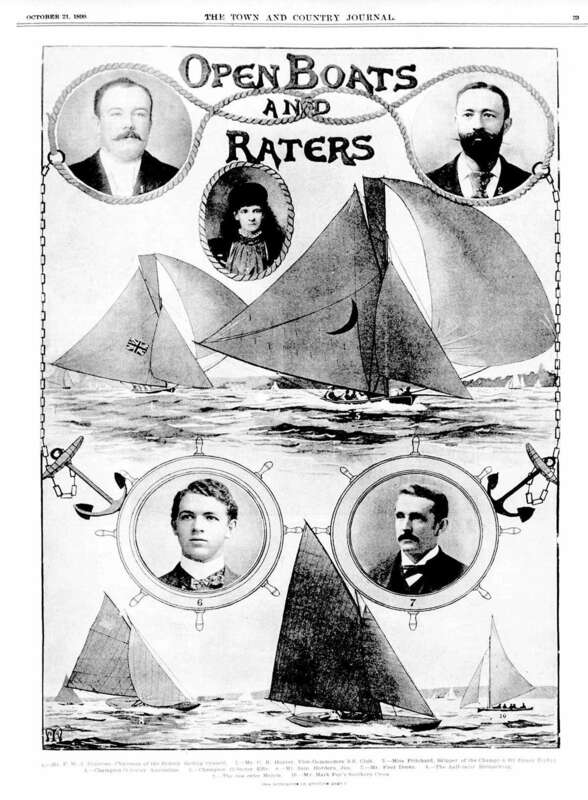 Sailing clubs in the 1890s differed in a number of ways from the clubs of today. Most did not have clubhouses: they met in local hotels, and sailed from local boatsheds. Nor did they race every weekend. Over the 1898/99 season, JBSC held only five races for 8-footers, but boats could also race with other clubs when the opportunity arose. 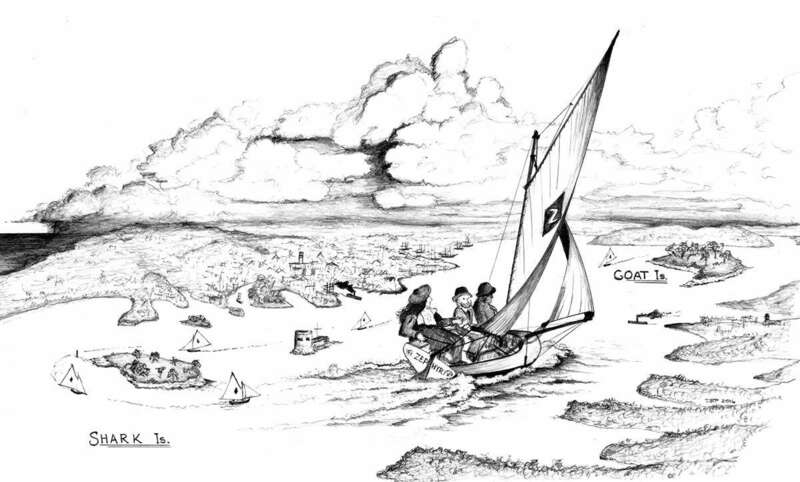 The clubs she sailed with all followed the same course for 8-footers: from Goat Island, which lies between the Harbour Bridge (yet to be built in Irene’s racing days) and Balmain, down the harbour and round Shark Island, which lies off Vaucluse, and back to Goat Island. Irene’s second race was in the Eight-Foot Championship of the Port Jackson Dingy (sic)7 Club, two weeks later on 7 January 1899. Zephyr capsized. 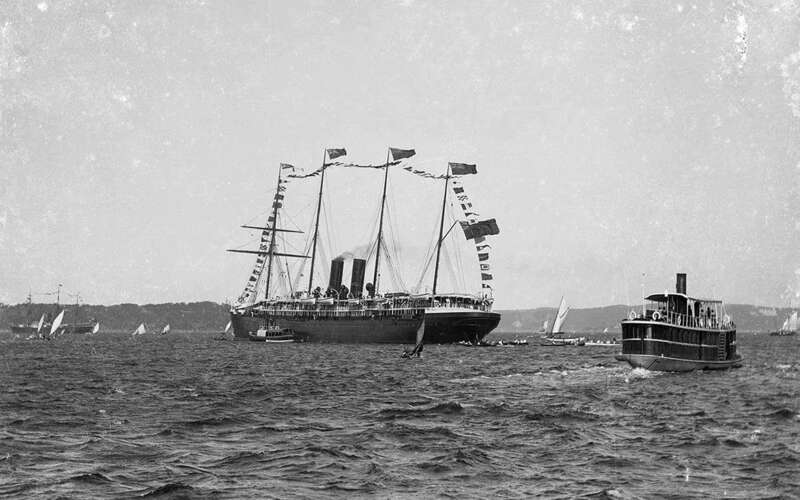 Her third race was in the Anniversary Day Regatta, now known as the Australia Day Regatta, on 26 January 26 1899. Irene became both the first woman to sail in the regatta, and the first to win an Anniversary Day race. An Anniversary Day Regatta on Sydney Harbour in the late 19th century. Inaugurated in 1836, the regatta drew large crowds. In the centre of the image is the passenger liner Orizaba, acting as flagship. ANMM Collection 00017559 Gift from the Estate of Peter Britz. The following Saturday, 12 February 1899, Irene again raced again with JBSC. Her handicap, which was five minutes in her first race, had understandably been pulled back to scratch. Zephyr came second, possibly because of the tactics of the third-placed boat, which was disqualified after Zephyr protested. Irene capsized in her next race, with the Port Jackson Dingy Sailing Club. The JBSC held its club championships for 18-, 10- and 8-footers on 25 February 1899. Chris Webb in The Australian was again victorious in the 18-footers. He always attracted an enthusiastic following and it is possible Irene received some of his reflected glory. Irene came in a full six minutes ahead of the second place getter, winning £2 and the club championship. In the last race of the season with JBSC, Zephyr came fourth, and was so late to the start in the last race with the Sydney Dingey club in March that it did not place. But the season ended on a high. Irene was presented with the Champion Pennant of the eight-foot class by JBSC, and acknowledged as a big prizewinner by the Sydney Dingey Club. In October 1899 Irene was featured in an illustration and article in the Australian Town and Country Journal. She was in esteemed company: Mr F W J Donovan was Chairman of the Sydney Sailing Council and commodore of the Johnstone’s Bay Sailing Club; Mr C B Hunter was Vice Commodore of the Sydney Sailing Club; Sam Hordern junior, in his half-rater Bronzewing VI, had a record in the previous season of eight first and three third places out of 18 starts; and Mark Foy was the man who revolutionised sailing on Sydney Harbour. The Town and Country Journal of 21 October 1899 featured an image of Irene captioned “Miss Pritchard, skipper of the champion 8ft dingey [sic] Zephyr’. 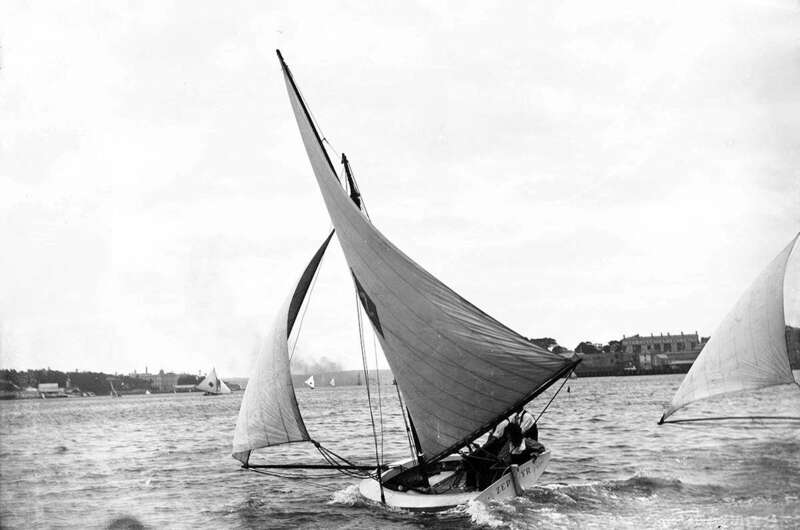 Irene next skippered the 10-footer Procella, which was also designed and built by her brother Harry. This also had a 10-foot beam, and provoked a lot of interest, much of it unfavourable. 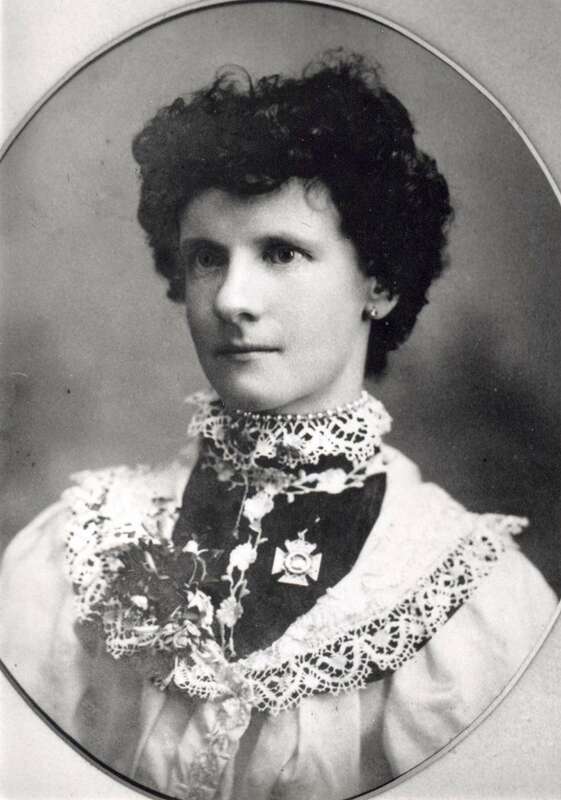 Irene Pritchard again made history when, on 7 November 1899, she was the first woman to compete in the Balmain Regatta, in Procella. She did not place. Her position was not recorded. And that appears to be Irene Pritchard’s last race. By all accounts Procella was an unusual boat, and one that was difficult to handle, carrying a huge area of sail. Later that year, the Evening News reported that Procella had been debarred, and had to be altered to comply with the rules.18 It is likely that the debarring ended Irene’s sailing career. Not until the 1960s would another woman take the tiller and race in an open boat on Sydney Harbour19. Irene’s sailing career might have ended, but her reputation grew, and she remained closely associated with sailing – and boatbuilding – for the rest of her life. Irene Pritchard wearing her Anniversary Day medal. The top of the medal, which is in the shape of a Maltese cross, is a yacht. Photo courtesy Nedlands Library, WA. Irene and Fred moved to Nedlands, Western Australia, pioneering an area that was then on the southern outskirts of Perth, on the Swan River. They first lived in a houseboat while building their boatshed, then lived in the boatshed and built the family home behind it. Irene seemed destined to be surrounded by males, and had six sons – Eric, Ivan, Keith, Cecil, Colin and Trevor. Carnaby’s Boatshed thrived. Fred constructed motor launches, yachts, luggers, pearling schooners and at least one ferry. He also built 16 Star class yachts, 22-footers with open cockpits, from the local jarrah. He rented them out, introducing many people to sailing on the Swan River. Irene Carnaby, née Pritchard, died in Perth in 1953. In 2015 Balmain Sailing Club awarded a trophy named in her honour, given to the top woman skipper in the Balmain Regatta. Vanessa Dudley was a fitting winner: in 1986, she had been the first woman to win a race at the helm of an 18-footer. — Åsa Wahlquist is a Walkley-award winning rural journalist and author. Since retiring she has written a book about Snails Bay Sabot Sailing Club, and is researching the history of sailing in Balmain. The author wishes to thank Anthea Harris from the Nedlands Library, Western Australia, for her assistance. This article originally appeared in Signals 117 (December 2016). Uncover more maritime history and stories in our quarterly magazine Signals. 7 Dinghy was also spelled dingy and dingey. 19 New Zealander Bev Coles, sailing her own boat in the 1966/67 season, seems to have been the first female skipper in an 18-footer, which were in the tradition of the old open boats. In June 1973 Seacraft reported the first all-female 18-footer crew at the Sydney Flying Squadron, in Moygashel. Newspaper articles accessed through Trove.